The entire editorial board of the Washington Post functions as a group of hilarious quack science Monsanto operatives pretending to be engaged in reporting real news. 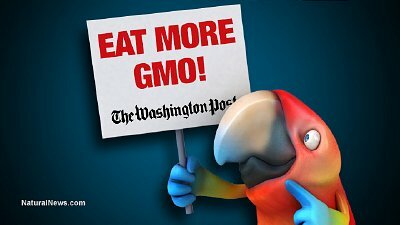 It’s so bad that key articles published by the Post now appear to be “written” by Monsanto, with the “Greenwashington Post” parroting Monsanto’s quack corporate “science” talking points. Nowhere is this more obvious than in the Post’s hit piece response to Chipotle’s announcement of going 100% non-GMO on their menu items. As background to all this, customer demand for non-GMO foods is exploding across America. People don’t want to eat foods laced with cancer-causing glyphosate, the herbicide chemical that’s sprayed on most GMO crops, and they also don’t want to eat foods made from GMO corn, a crop which grows its own deadly pesticides inside every grain. The fresh food movement is taking America by storm. As a result, consumer demand for cleaner, non-toxic food is skyrocketing everywhere. Chipotle, invoking the power of free market principles to respond to shifting consumer demand, made an informed, progressive choice to respond to that consumer demand by eliminating genetically engineered ingredients from their entire menu. This was widely celebrated by customers who are flocking to the restaurant while simultaneously walking away from food chains like McDonald’s that are steeped in the practice of serving GMOs. In response to this brilliant market decision, the Washington Post — forever the mouthpiece of corrupt corporations, toxic industrial chemicals and disastrously bad government — went on the attack, deriding Chipotle’s menu shift as a “gimmick” and claiming the decision was anti-science. Unbelievably, this response was authored by the entire “Editorial Board” of the Washington Post, whose loony rationalizations sound exactly like those of paid Monsanto trolls such as the felony criminal running the widely discredited American Council on Science and Health, recently exposed as a “troll brigade” of biotech-funded criminals whose attack on Doctor Oz exploded in their faces. The most vehement denunciation of Chipotle’s recent decision came from the editorial board of the Washington Post, which wrote, “Thus has a leading food company added its imprimatur to a global propaganda campaign that is not only contrary to the best scientific knowledge but also potentially harmful to vulnerable populations around the world.” Apparently the editorial board feels qualified to decide unilaterally who the “best” scientists are — and this without even considering who is being paid by whom. This hilariously ignorant science explanation is ripped from page one of Monsanto’s quack science trolling playbook. It intentionally conflates selective breeding with genetic engineering, deceitfully implying that they are biologically equivalent. Any high school science student would earn an “F” if they answered the test question, “Explain genetic engineering” with the ludicrous answer offered by the Washington Post: It’s basically the same as selective breeding. The Washington Post’s editorial board, it seems, flunked out of basic science, and that unfortunate state of cognitive incompetency weaves its way through the paper’s science scribblings on a daily basis. As any educated scientist knows, genetic engineering is the artificial alteration of the genetic code of a plant by inserting genes which often come from soil microbes, insects, or other life forms “alien” to that plant. Genetic engineering is artificial and fraught with potential danger because it is a self-replicating technology with unknown long-term consequences to the biosphere. GMOs are therefore a potential source of genetic pollution in addition to all the other risks they pose to consumers and the environment. Beyond that, GM crops are also giving rise to herbicide-resistant superweeds in exactly the same way that modern medicine’s abuse of antibiotics has given rise to superbugs. This explanation is, of course, another biotech industry talking point that no informed person who isn’t on Monsanto’s payroll really believes. In truth, GMO crops are failing like never before, and the promise that GMO agriculture would require less application of pesticides turned out to be completely false as well. Glyphosate, in particular, is now globally recognized by the World Health Organization as being linked to cancer, and more and more nations around the world are banning it outright. GMOs and glyphosate go hand in hand, of course: You can’t have one without the other. The Washington Post, like every other group of biotech-corrupted trolls who pretend to be journalists, hilariously implies that glyphosate is safe — largely because Monsanto told them so! Who needs REAL science when you’ve got paid “corporate science” instead? When the Post’s arguments begin to resemble the same talking points of people like Jon Entine — a paid biotech troll and character assassin who was exhaustively exposed by Natural News — you know the Post’s credibility has been totally abandoned. Then again, all this probably doesn’t come as a surprise to anyone. We live in an era when the mainstream media is almost universally perceived as an institution of corporate-funded professional liars. That’s why public trust in the lying mainstream media is plummeting by the day. Thanks to revelations about Brian Williams (NBC’s liar-in-chief) and George Stephanopoulos (ABC’s liar-in-chief), everybody now knows that all the big mainstream media outlets are run by compromised liars and political operatives who twist the news to appease their egos, their advertisers, or their political controllers. The Washington Post is the classic example of this. Its science editors are so incredibly compromised by industry influence that they can’t get their heads around this logic conundrum: If vaccines confer immunity, then vaccinated children have nothing to fear from unvaccinated children. Therefore, unvaccinated children pose no risk to vaccinated children… unless we’ve been lied to about how well vaccines work, of course. You won’t find a single Washington Post science editor who can exercise anything resembling real logic on issues like GMOs and vaccines. Instead, they express what can only be called “zombie logic” — the mindless obedience to official sources while invoking ridiculous twisted justifications for the continued mass poisoning of the people with glyphosate and mercury in vaccines. See my article Irrefutable proof that influenza vaccines routinely given to pregnant women still contain mercury. * Was the first scientist in the world to document the lead and cadmium contamination of brown rice protein and achieve the world’s first industry agreement to reduce those contaminants. * Invented and patented (pending) the world’s first cesium-binding dietary supplement that can protect lives during nuclear disasters by blocking the body’s absorption of radioactive isotopes of cesium-137. * Have invented the world’s first 3D-printable device that removes arsenic from contaminated well water. I’ll be giving away this invention to the entire world for free, via FoodRising.org. If the Washington Post had any interest at all in independent food science, they would be contacting me for laboratory assistance, not attacking Chipotle and its fans. But as we’ve already established, the Post isn’t interested in real science. It’s far more important for the paper to protect the financial interests of its corporate advertisers. The sad thing is that I don’t believe the Washington Post’s obedience to Monsanto really reflects the intentions of Jeff Bezos, the new owner of the Post. Maybe it’s time for Bezos to knock some heads around and clean a little house. The Post, after all, could gradually restore its trust and credibility by apologizing to its readers, firing its scientifically illiterate editorial board, and reporting the truth about glyphosate, genetic pollution, seed monopolies and Monsanto’s nefarious and deceitful tactics.